In a major crackdown on illegal gold prospecting that threatens isolated tribes in the far reaches of the Amazon rain forest, Brazilian army soldiers and indigenous affairs agents have destroyed mining platforms along a remote river where an alleged massacre of tribal people was reported two months ago. Officials of the indigenous affairs agency, FUNAI, said that ten gold dredges were blown up on the Jandiatuba River during an expedition late last month, and more than 30 miners were detained and charged. Officials said the propectors were released on their own recognizance, and the expedition proceeded upriver to look for any enduring signs of a possible clash between miners and indigenous inhabitants of the region. 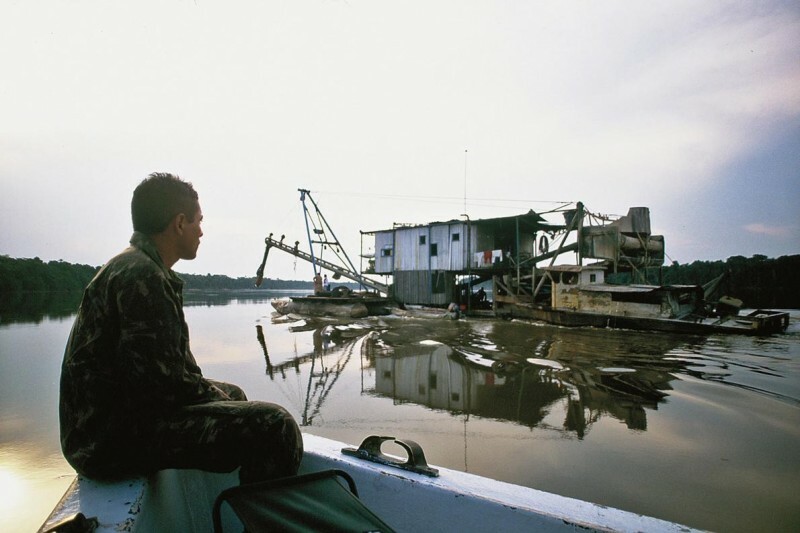 The floating mining platforms have been seen as a menace to the security of the so-called flecheiros—or Arrow People—a collection of several communities of indigenous hunter-gatherers living in extreme isolation within the Javari Valley Indigenous Land. The reserve, a sprawling territory of river-laced ravines and primal upland forest in far western Brazil, hosts the largest concentration of isolated and so-called uncontacted indigenous communities in the world. Many of those communities are scattered throughout the headwaters of the Jandiatuba and the neighboring Jutaí River. The presence of the illegal dredging machines on the Jandiatuba River came to light in September, as reports surfaced of a possible mass murder of tribal nomads committed by bushmeat hunters seeking food for the mining crews. FUNAI had maintained an outpost on the river to control access into the depths of the Javari reserve. But budget cuts and a reduction in experienced field personnel forced its closure in 2014. Alluvial gold dredges such as those demolished in the recent crackdown are Rube Goldberg-like contraptions, with crane-mounted drills and huge suction tubes that wreak environmental havoc, chewing up riverbanks and spewing toxic pollutants into the waterways. In addition to ridding the river of the prospectors and their destructive platforms, the government expedition also heralded the reopening of the abandoned outpost, seen by officials as a critical step in reestablishing control in an otherwise lawless region. A small detachment remained at the site to start rebuilding the post, which had been stripped of materials, presumably by the garimpeiros, as Brazil’s gold prospectors are called. “It will take a good two months to get the base fully up and running again,” said Bruno Pereira, FUNAI’s regional coordinator who works closely with the Javari Ethno-Environmental Protection Front, operated by FUNAI’s Department of Isolated and Recently Contacted Indians. The department maintains 10 other similar fronts throughout the Brazilian Amazon to safeguard the territories where the presence of isolated tribes has been confirmed. Severe cuts in FUNAI’s budget under the current government of president Michel Temer have sharply reduced the agency’s ability to staff and operate the fronts. In keeping with Brazil’s standing policy to avoid contact with isolated indigenous communities, the party retreated after documenting the tribe’s presence and apparent well-being. Like other isolated groups living in the deep recesses of the Amazon rain forest, the Arrow People remain highly vulnerable to contagious diseases, against which they possess no immunological defenses, as well as to potential acts of violence by outsiders. Of the dozens of isolated groups whose existence has been confirmed by FUNAI, the Arrow People are one of the most mysterious. No one knows what language they speak, what their ethnicity is, or what they actually call themselves. The Javari reserve is the second-largest officially recognized indigenous territory in Brazil, nearly two-thirds the size of the Florida peninsula. Its geographical features—with all its major waterways flowing in an easterly direction—make it one of the most pristine and easily defended wilderness regions in the Amazon. Officials drew up the boundaries of the reserve in the late 1990s, and subsequently four checkpoints were strategically positioned on the major rivers to thwart any large-scale penetration by loggers, miners, or industrial fishing fleets, thus safeguarding the isolated indigenous groups living within its folds. News of a possible massacre of Arrow People first reached FUNAI officials in August, after miners were overheard at a frontier town bar as they boasted of killing “wild Indians”—including women and children—on the banks of the Jandiatuba and taking artifacts from the victims as trophies of their exploits. The garimpeiros reportedly spoke of dismembering the bodies and throwing them in the river to destroy any trace of their deeds. Casting further doubt on the allegations, veteran field officials said that drunken boasts of outlandish deeds are not uncommon among grizzled frontiersmen when they return to town after weeks in the bush. Investigators sometimes check out the stories and find no evidence to corroborate the tales. Some FUNAI officials and other critics have expressed dismay over the handling of the investigation. No attempt was made at the time to reach the alleged crime scene. The police confined their inquiry to an overflight of the area and interviews with the suspects and others from the frontier city of São Paulo de Olivença, where one official reports that “everyone lives in fear” and no one wants to be seen as interfering with the lucrative gold trade that stokes the local economy. Even if investigators had managed to arrive at the site, the Amazon’s vast distances, sparse population, and carnivorous fish may have conspired to foil their attempts to find solid evidence of a crime. FUNAI officials are greeting the results of the expedition with jubilation. The gold dredges on the Jandiatuba River are gone, and so are the prospectors. For now. But funding for the agency was slashed by 50 percent in the past year. President Temer’s government has made no secret of its hostility toward protections of the environment and indigenous lands that stymie the expansion of agriculture, mining, and other industries in the Amazon. Far to the north in the state of Roraima, a gold strike has drawn hundreds of prospectors to a remote area perilously close to one of the last remaining communities of isolated Yanomami Indians.